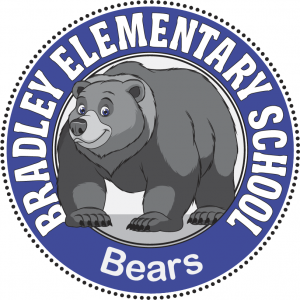 Lucille J. Bradley Elementary PTO – Home of the Bears! 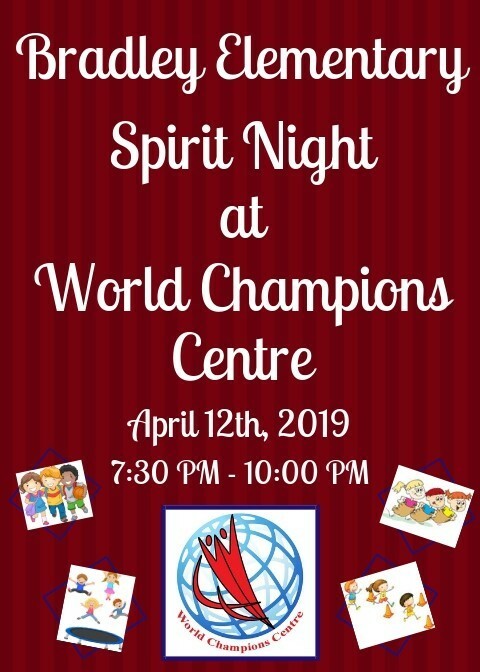 Parents Night out this coming Friday night … Leave your kiddos at World Champions Centre and go have some fun … or some quite time … whichever you choose! Complete the form below to reserve your spot. We will be offering cash-only concession snacks during the event; they will range from $.50 – $1.00 . All reservations must be paid on-line there will be no admittance at the door. Please visit the WCC website to complete your waiver in advance. Reserve your space TODAY! Limited spaces are available. Join us on Saturday March 30th for our first annual Mad Hatter Mommy Daughter Tea Party. Our event will be held at Hochzeit Hall in Old Town Spring from 1PM – 4PM. We would love to see all of our Bradley girls with their moms, sisters, grandmothers and aunts. Ticket Sales will close on Thursday, March 28th. Please note that due to limited space only a limited number of tickets will be available and tickets will only be available online. Click Here to purchase your tickets TODAY!!! 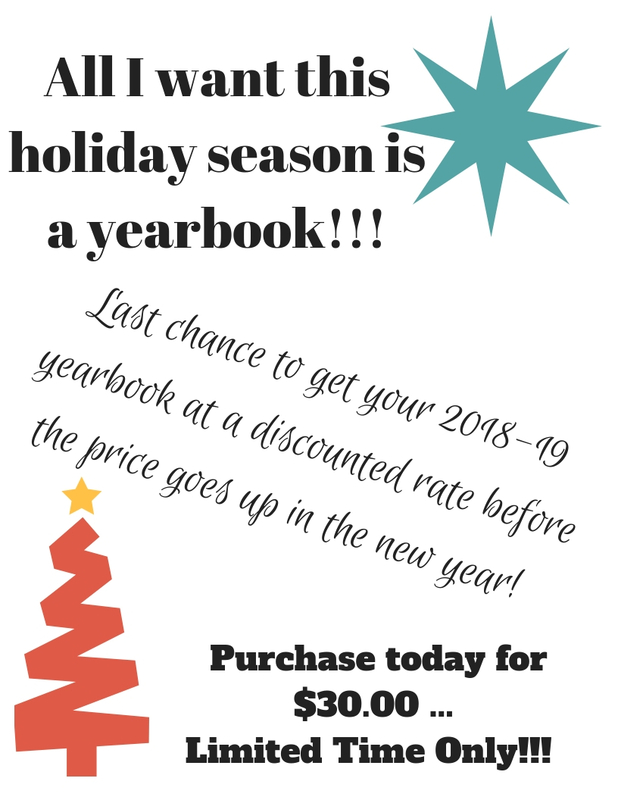 Time is running out on getting your Bradley 2018-19 yearbook at 2018 prices! 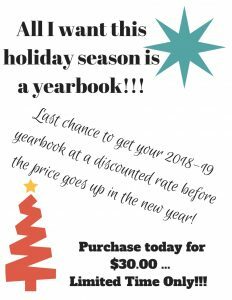 The $30 price will only be good until December 31; so get your yearbook purchased TODAY!!!! Who’s ready to get their pizza on!??!? Com join us all day on Thursday, December 13 at Crust Pizza Co on Rayford Rd for an all day Spirit Night! Spirit Nights are an easy way to make a big impact on our PTO’s fundraising efforts. 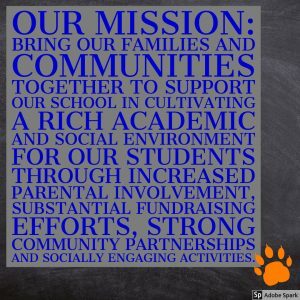 Share with your family and friends, it’s a great way to involve the community in our children’s education without having to knock on doors and sell stuff! Just remember whether you dine in or carry out … drop your receipt in the box! Can’t wait to see y’all there!!! 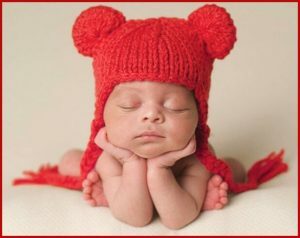 Come crochet or knit with us on Monday December 10th at 10 AM, as we make little red hats for babies born in the month of February – also known as Heart Health Awareness Month. The Little Hats, Big Hearts program is a joint effort of the American Heart Association and the Children’s Heart Foundation to bring awareness to both Women’s Heart Health and Congenital Heart Defects. It’s time for our second gathering! We will still meet again in January to get ready for delivery to the American Heart Association for distribution at local hospitals. 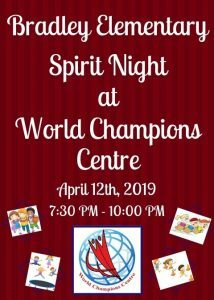 If you are unable to attend but would still like to participate please feel free to drop off your donations (of either yarn or completed projects) to the schools front office. If you have any questions please feel free to PM me. At the gatherings we will provide patterns as suggested by the program and have also received generous yarn donations so we have yarn for your projects. Should you want to provide your own yarn it must be either acrylic or cotton red or mostly red if you choose a variegated yarn. Please keep in mind the skin sensitivities of newborn babies as you make your yarn selections. They also ask that the hats don’t have any bows or buttons that can easily come off. Please bring your own needles, hooks, and other necessary tools. If you have any questions about this project or how you can help please feel free to reach out to me! Join us for a fun night of skating on Thursday, December 6! Concessions will be open for dinner and the first 100 skaters will get a free spirit stick!!! The staff at SK8Town wish to provide a clean, wholesome family atmosphere where you, your family, and your friends can come and have fun! Most of our sessions include skating games and activities including a chance to race. We offer a full concession stand for drinks and refreshments. We also have games and a redemption counter packed full of prizes. Winter Wonderland Festival 2018 … Thank you!!! We want to thank all the families, volunteers, vendors, sponsors and performers that made this event possible!!! 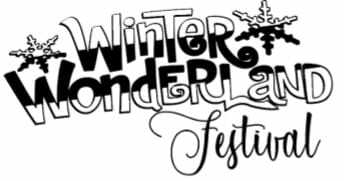 We are so beyond thrilled with the response to our first annual Winter Wonderland Festival and can’t wait to watch this event grow year after year. Come join us on Saturday, December 1st from 11:00AM – 5:00PM for a day full of fun, community and holiday spirit! 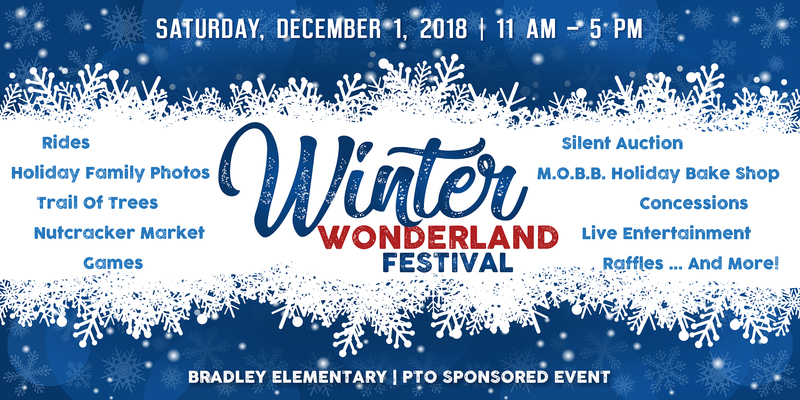 Our first annual Bradley Elementary PTO Winter Wonderland Festival will have rides, games, live entertainment, and fun for the whole family! Come shop our Nutcracker Market or try your luck at winning those gifts by entering the silent auction. Drop your name in for the opportunity to win some raffled prizes by our wonderful Nutcracker Market Vendors and other local community businesses. If you get hungry our PTO Hospitality team will have concessions on-hand and if you have a sweet tooth the M.O.B.B. 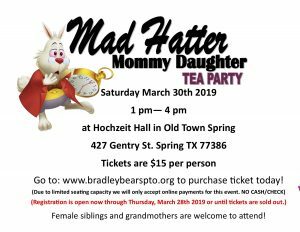 (Moms of Bradley Bears) will be hosting a Holiday Bake Sale. While your here visit our very own, the talented Jennifer Chenault of JL Chenault Photography for family holiday pictures you’ll cherish year after year! And the main attraction of the whole event will be our wonderful “Trail of Trees”. A wide selection of Christmas trees that will be auctioned and donated to various charitable organizations in our area to help ensure that those less fortunate will have a magical holiday! 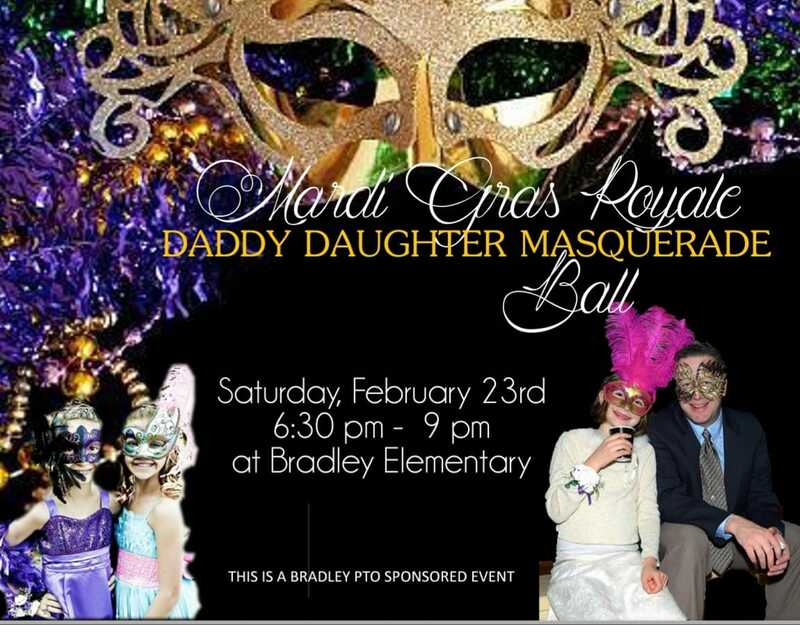 We look forward to seeing all of our Bradley families at this wonderful event! 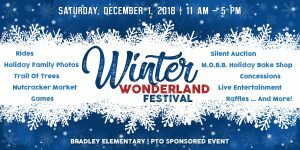 **For any inquires about the event please email winterwonderland.bradleypto@gmail.com. 2nd Annual Trunk or Treat! It’s time for ghosts and goblins!!! Join us for Bradley Elementary’s 2nd Annual trunk or Treat. Whether you want to register your vehicle or just join in on the fun please complete the form below and return to your child’s teacher. All vehicle entries must be received no later than, October 24th in order to be considered! We will also gladly be accepting candy donations at the front office! Casual Conversations with the M.O.B.B. M.O.B.B. members are invited to engage in round table conversations that address issues impacting their students social, emotional, academic growth and family life. This months conversation: Finding Me! How to create harmony and bring balance during life’s most stressful moments without losing yourself. These conversations are facilitated by trained licensed professionals. M.O.B.B. embers will receive more details via email. Here is more information about the M.O.B.B. We have some volunteer opportunities available! Library Assistance – Ms. Rock the Librarian is looking for help every day to assist with students checking out books as well as re-shelving at the end of the day. To sign up to help click here. Work Room Assistance – There is help needed in the school work room, making copies and laminating documents as requested by the teachers. If you are interested to sign up click here. Enjoy yourself with a date night, a girls night or maybe just a quite evening at home. All parents are invited to attend our monthly PTO meeting! You will hear reports from several PTO members, learn what’s going on around the school, what’s coming up and how you can help! Morning meeting will be held in the PTO room at 10 AM. Evening meeting will be held in the Bradley Cafetorium at 6:30 PM. Spirit Store Closes This Friday! This Friday, August 28, will be the last day to order your Fall 2018 Spirit-Wear! We have placed remaining spirit shirts on the website and when they’re gone … they’re gone! Get Ready for our First Family Fun Night! The PTO is excited to kick off it’s first event of the school year – Cinema on the Lawn! Bring the whole family out for a night of fun. Admission is free! 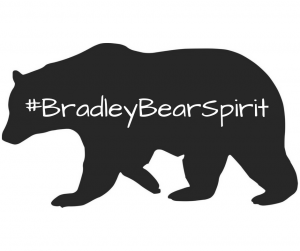 And the first 50 Bradley Bears to arrive will receive spirit sticks. Bring your lawn chairs and blankets … but leave your coolers at home, because we’ll have plenty of concessions to choose from with all proceeds benefiting The Bear Cave; our school store !!! Will be watching Wreck it Ralph. A movie about a video game villain wants to be a hero and sets out to fulfill his dream, but his quest brings havoc to the whole arcade where he lives. 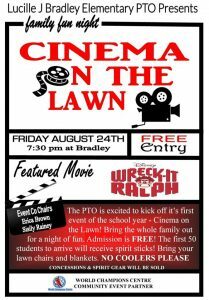 As part of the Bradley Elementary community, all parents are part of the Bradley PTO. Please take a minute to look through our website. You can meet the Executive Board, register to receive updates from the PTO and get information on how you can help the school by participating in PTO-driven activities and fundraisers. Here is a welcome letter from our PTO president!